This review was first posted on Music, Books and TeaWhen Legend was first released, I had absolutely no interest in it whatsoever. Then all these positive reviews started popping up on the blogs that I read, and I started reading more dystopia, and I realised that there was no way I could pass up an opportunity to read this book!Legend was full of my favourite element for a dystopia: action. 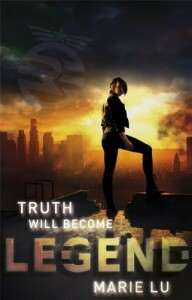 There was never a dull chapter, or even a dull moment, Legend kept me turning its pages right until I finished the book. It had a dual narrative, which I loved, and Marie Lu's writing was excellent.I loved both Day and June. As it was a dual narrative, we were able to learn a lot about both these characters. June was an incredible character, as she wasn't afraid to do what she thought was right, and she wasn't afraid of the tasks she would have to undertake on her way. She does a fair amount of growing up too, when we're first introduced to her, she's in the Dean's office at her college, because she's in trouble again, and has to rely on her brother Metias to get her out of trouble, and by the end of the book, she's a fearless leader. June definitely reminds me of Katniss from The Hunger Games, or Tris from Divergent in terms of her character - she's definitely not wishy-washy!Then there was Day. He's the country's most wanted criminal, and I completely understood why he had turned to a life of crime. Life for him and his family was not easy at all, they had very little money to get by on, and as Day had failed his test and almost lost his life, thanks to the Republic, so you can really appreciate the vendetta he has against them. I was definitely disappointed in June for turning him in, especially as he had to watch his mother be shot to her death right in front of his eyes. Day would do anything for his family, even if it meant he risked his life to do so. In the first few chapters, we see Day break into a hospital to try and get a cure for his younger brother who has caught the plague. But it was also clear that his family would do anything for him, which we learnt right at the very end of the book.There are so many fantastic twists and turns that I want to talk about in Legend, but the one I think I enjoyed the most was where June uncovered the secret message Metias had left her, and also found the website he had created in order for her to uncover the truth. That definitely sky-rocketed my interest in Legend (which was already insanely high to begin with), and it made sure that I carried on reading right until the end. I was upset that Metias died as early as he did, as I really liked his character in the short amount of time that he was actually in the book.Overall, Legend was an insanely fast-paced, action packed dystopia. There was a little romance in it, but it definitely didn't detract from the main part of the book. I can't wait to see what happens with June and Day in the next book, Prodigy, although I wish I didn't have to wait so long to read it!